New Delhi: Vice President of India, Shri . M Hamid Ansari on Wednesday tendered a terse advise to the government, stressing that it should constantly revise its policies in terms of skilling its people, given the dynamic nature of industry requirements. Delivering the Valedictory Address at a Conference on Skilling India for Global Competitiveness under aegis of PHD Chamber of Commerce and Industry here today, Shri Ansari was emphatic in asserting “given the dynamic nature of the industry requirements, our policies would need constant revision to keep them relevant and effective for skilling our people at a scale with speed and quality”. He, however, added “initiatives like formation of sector skill councils and formulation of the national skills qualification frameworks, among others, came about between 2009 and 2014. The National Policy on Skill Development and Entrepreneurship, 2015 takes those initiatives forward. The launch of new initiatives like the Pradhan Mantri Kaushal Vikas Yojana and the very ambitious ‘Skill India’ initiative, that aims to train about 30 crore people by the year 2020, are much needed efforts. These initiatives would, however, need an inclusive approach to succeed, with special focus on the 800 million or so citizens who remain at the bottom of the pyramid”. 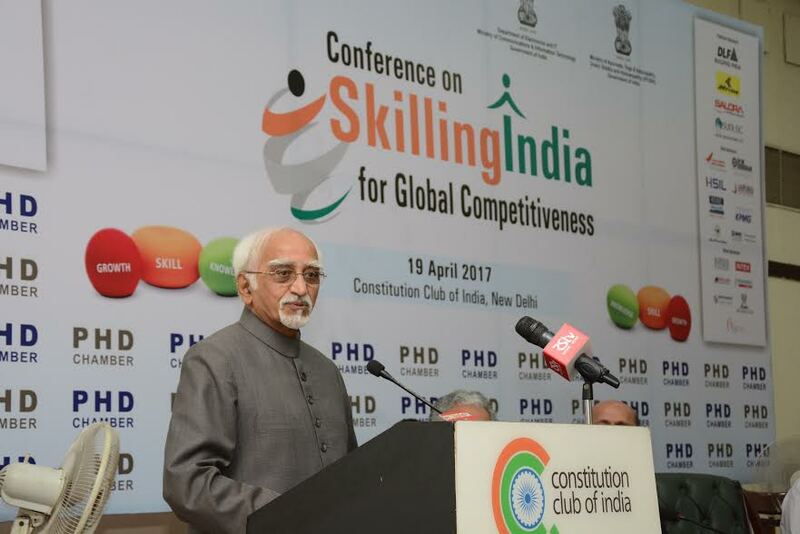 The Vice President further emphasized reminding industry that the government faced three major challenges in the task of providing adequate skill building opportunities for its people comprising quality, numbers and perception. In his welcome remarks, President, PHD Chamber, Mr. Gopal Jiwarajka said that skilling should happen in a way so that its byproduct becomes employable in all verticals of industry in suitable consultation with all sections of industry. Among others who spoke on the occasion comprised, Sr. Vice President, PHD Chamber, Mr. Anil Khaitan; along with its Chairman, Skill Development Committee, Mr. Sanjeev K Duggal and Secretary General, Mr. Saurabh Sanyal.